Floyd Mayweather has revealed he has promised his children that his August 26 fight with Conor McGregor will be his last. The undefeated 40-year-old will fight for the 50th time as a professional when he faces boxing debutant McGregor at light-middleweight at Las Vegas' T-Mobile Arena later this month. Mayweather twice announced his intention to retire after defeats of Oscar De La Hoya and Ricky Hatton in 2007, and insists he also saw his most recent fight, against Andre Berto in September 2015, as his last. But having been lured back by such a lucrative and apparently low-risk match-up, he is adamant that he will follow the recent examples of fellow modern greats Wladimir Klitschko and Juan Manuel Marquez by retiring once and for all. 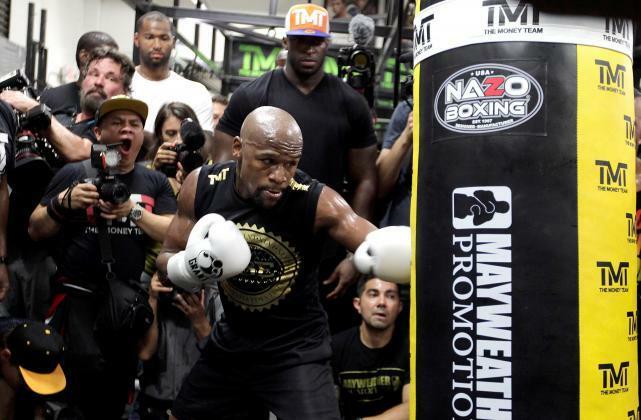 "I thought Andre Berto was going to be the last weigh-in, the last training camp," the American said. "Honestly speaking, I thought that was going to be my last everything. "But you never know what can happen. Now we're here for this big event. "This is my last one, ladies and gentlemen. I gave my word to (advisor) Al Haymon, I gave my word to my children, and one thing I don't want to do is break that. "I gave Haymon my word, I gave my children my word. I'm going to stick to my word. This will be my last fight. "My real estate portfolio is truly amazing; that's a huge part of my life. My children are going to college - that's going to take up a lot of my time, because education is extremely important in my home. "I've got businesses started so both my children and children's children can take over from there." Although Mayweather dominated against Berto and was widely considered the world's finest fighter, there is also little question he has subtly declined from the exceptional peak he demonstrated around 2010. His 49 victories from his 49 fights contribute much to the legacy he has built as one of the best in history, but he has matched himself masterfully throughout his career, and acknowledges that he is not the fighter he once was. "I don't think I'm the same Floyd Mayweather I was 21 years ago (when I made my debut) - of course not," he said. "I'm not the same Floyd Mayweather as 10 years ago, not even five or two years ago. "But I still said that I still have a high IQ in that ring, and experience-wise, (this fight) leans towards me. Most times when I go out there and compete against any fighter, experience will always lean towards me, because I've been in that ring and competed at such a high level for so long."